The Voice Season 15 Grand Finale begins tonight, Monday, December 17, 2018. Results and winner announcement on Tuesday, December 18, 2018. Each artist will perform three songs — a solo cover song, a duet with their coach, and an original song. The live two-night live finale event will feature performances from guest artists such as Marshmello, Bastille, Halsey, Mark Ronson, Miley Cyrus, Brynn Cartelli, Kelly Rowland, John Legend, Rascal Flats and more. Where to watch The Voice Season 14 Live Finale? The Voice Season 15 Grand Finale will air Live on NBC at 8/7c. The show is also available to watch NBC’s official live streaming channel online. 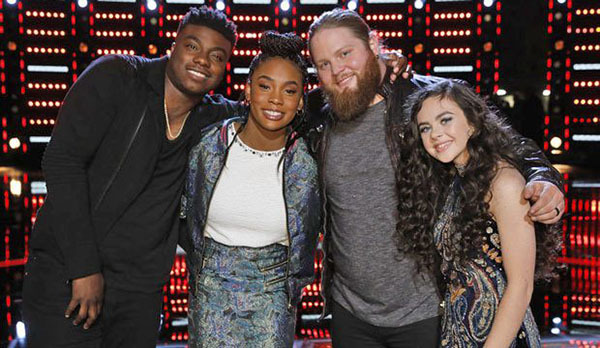 Who do you think will be The Voice? Kirk Jay, Chevel Shepherd, Kennedy Holmes or Chris Kroeze? Write your prediction on the comment section down below. Keep locked on this page, performance recap and videos will be added below once available online. The Voice is a top rating singing competition aired on NBC. The show is based on the original The Voice of Holland. The Voice aims to find currently unsigned singing talents ages 15 or above. The winner is determined by television viewers through public voting. The winner will receive $100,000 cash prize and a record deal with Universal Music Group.